The large 14.5L fuel tank will provide a full day or nights work. This model is IP56 Worksafe compliant with a lockable battery isolator, emergency stop, central lifting hook, weatherproof circuit breakers & RCD’s. It comes standard with 2x weatherproof power outlets (15amp), 4x castor wheels with brakes, a silenced powder coated sound proofsteel case with maintenance doors and a central lifting hook. Himoinsa Generators are supported Australia wide by Crommelins Machinery and come with a one year manufacturer’s warranty. 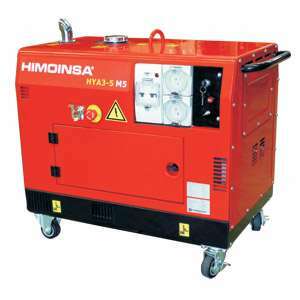 Himoinsa Diesel Generators are used worldwide in the construction industry, at mine sites, hospitals, airports and any locations where backup and continuous reliable power is essential.